Want to know what’s going to happen with the Australian property market in 2019? We’ve analysed the latest Australian property market forecasts from the banks and specialist forecasters and compiled a roundup from now through to 2019 and beyond. experts now predict nationwide prices to continue dropping this year and into 2019 before stabilising and beginning to rise in 2020. Jump ahead to see national house or unit forecasts or to find out what experts predict for your capital city. Before diving into what the future looks like of the Australian property market for 2019 and beyond, let’s see what’s currently happening across the country (courtesy of Corelogic). prices to stabilise in 2020 instead of 2019. SQM Research does not expect a general housing price crash to occur this year. The conditions required to create such a downturn are not in the housing market at present. The national economy is overall, healthy. Unemployment is relatively low and stable. Population growth is very strong. Oversupply of new real estate is only occurring in pockets. SQM Research also put out a separate Housing Boom and Bust report, reiterating that the housing downturn will continue into 2019, especially in Sydney and Melbourne. On average, they are predicting a -6% to -3% fall in house prices, continuing the average -4.5% fall of the last 12 months. These figures are based on a Labor government win in the Federal Election, a negative gearing repeal and capital gains tax changes passing. An updated 2020-2022 forecast has also been published. Using SQM Research’s Housing Boom and Bust report, we have created a calculator that finds the mid-point of their base case scenario and calculates an estimated property market value. The calculator asks for the capital city (or region close-by) and then takes in an estimate of your property’s current value. Looking to sell in or before 2019? You might want to start talking to a real estate agent to see their opinion on your particular suburb or area’s performance in 2018 and 2019. Make sure you use our real estate agent comparison tool to find a local, experienced agent that can give you an accurate property value. Population growth and high median house prices have resulted in increased unit development in all major Australian cities. In some cities, the increase has led to oversupply, causing median unit prices to drop. For those looking to enter the property market, units appear to be the most affordable option. Sydney and Melbourne expected to reach super city status, which is set to have an impact on the property market. This has made entering the market increasingly unachievable for many would-be homeowners, resulting in units becoming an ever more popular option. Adjustments to stamp duty and the introduction of new concessions by NSW and VIC governments have helped to offset price increases. However, these changes mostly affect units, as median house prices are usually higher than the cut-off amount for concessions. Interest rates are at an all time low, with the most recent interest rate cuts occurring in 2016. Despite rising house prices, low interest rates are making it easier for investors to enter the property market. Increases will vary significantly between states, with the lowest expected to be 3.9% in Perth and the highest to be 18.3% in Canberra. Hobart is the only exception, experiencing the most significant increase this year and smaller increases in 2019 and 2020. Of the eight major cities, only Sydney (-5.4%) and Darwin (-2.8%) will experience an overall decline in median house price. However, BIS Oxford Economics expect this to slow in 2019, with increases beginning in 2020. 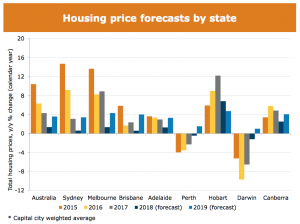 Despite this, median house prices are likely to finish below current median prices for both cities in 2020.
increases to be subdued and limited to Adelaide, Brisbane and Hobart. BIS Oxford Economics expect median unit prices to decrease, predicting the largest depreciation to occur this year. Smaller decreases should occur in 2019, with median prices either plateauing or increasing slightly in 2020. An exception to this is Brisbane, which will likely see decreases in median unit price throughout the next 3 years. Adelaide, Hobart and Canberra are the only Australian cities predicted to see an increase in median unit price, with Hobart seeing a significant increase of 13% by 2019. 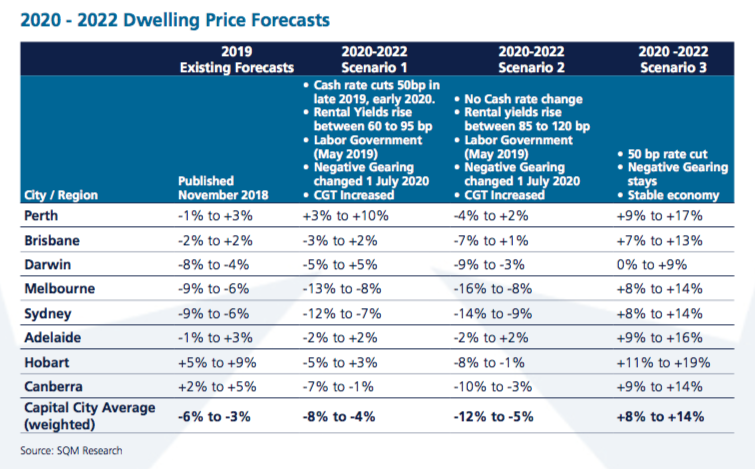 These figures have already changed significantly between QBE’s initial forecast report in June 2017 and the 2018 update, so it is essential to keep abreast of changes to the assumptions that underpin these predictions. You can download the 2017–2020 report here and the 2018 update here. As with housing, the major banks have predicted more subdued increases in median unit price, with Hobart scaled back by half (6.5%) that predicted by BIS. 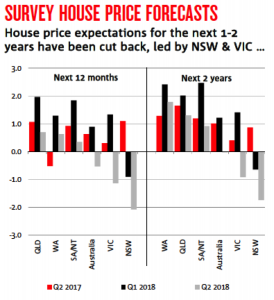 Despite the current downturn in the market, prices will continue to increase in many Australian cities over the next 3 years, albeit at a slower rate. The overall trend of slowing growth differs by major city, and you can find details on each below. 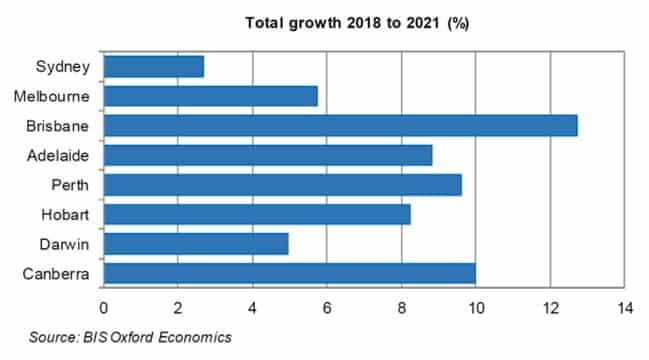 The following graph from the Residential Property Prospects 2018–2021 report by BIS Oxford Economics provides an overview of expected growth between now and 2021. Brisbane’s jump to top major city for relocation. The major banks’ more conservative predictions for 2019 and 2020 will likely bring this increase down, but the city should still show growth by 2021. Brisbane has experience a dramatic increase in unit supply, with unit construction rates rising from 36% to 57% of new housing stock. Despite the increase in migrants, experts expect unit prices to depreciate by approximately 10% by 2020 due to forecasted oversupply of units. After an initial decrease of 5% this year, 2019 is set to see a further 2% decrease, followed by 3% in 2020. According to the SQM Research Boom and Bust 2019 report, Brisbane will be less volatile than other capital cities in 2019. In all 4 of their hypothetical scenarios, Brisbane could see anywhere between a -2% to +5% growth figure. Experts predict that median unit price will follow a similar trend, with a predicted overall decrease of 6.3% by 2020. The majority of this decrease will occur this year and into 2019 and prices should begin to stabilise in 2020, which remains consistent with downgraded predictions from major banks. Property market experts SQM Research also predict a similar trend for 2019. In their base case scenario, they predict a decline of -9% to -6% and a best case scenario of -3% to 0% if the banks intervene on interest rates. Melbourne house prices reached their peak at the end of 2017 and are expected to remain stable through to 2021. At 2% per year, BIS’s predicted increases are insignificant and will be below levels of inflation. Current high levels of construction will see the release of an abundance of new dwellings; however, expected population growth should offset any effect this supply will have on housing prices. Contrary to this, major banks predict a drop of 2.4% this year, with prices stabilising in 2019 and increasing from 2020. The QBE Australian Housing Outlook Update 2018 predicts a decline in median unit prices (approximately 4%) by 2020, with most of this decline occurring in 2019. 2020 should see unit prices stabilise. This appears to be in line with major bank predictions. In SQM Research’s newest report on market predictions, Melbourne is trending towards a similar trajectory as Sydney with a -9% to -6% decline by the end of 2019. At worst, they predict a fall of -11% to -6% if the interest rates rise. Supply and demand appear well matched in Australia’s capital city. Median house price is set to increase by a further 8% by 2020, with 5% growth occurring in 2019. 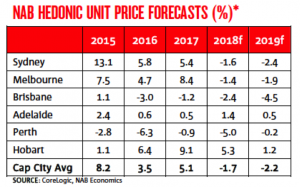 Unlike many other Australian cities, experts predict median unit price in Canberra to appreciate by 2020; however, at 1% per year, the increase will not be significant. According to SQM Research’s Housing Boom and Bust report for 2019, Canberra has seen the second highest growth between October, 2017 and October 2018, showing a +4.3% increase in property value. 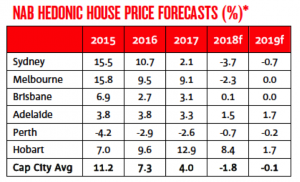 They predict a slightly muted continuation of this trend for 2019 in their base scenario with a +2% to +5% property market forecast. Unit prices will remain stable in 2019 before rising by 2% the following year. SQM Research has also thrown their hat into the ring with their own predictions. Adelaide has shown some modest growth in 2018, but they predict a small decline in their base predictions for 2019. We could see a -1% to -3% decline in Adelaide’s property values, but SQM Research also predicts a small amount of property growth (0% to +3%) if the banks intervene. SQM Research have also given an opinion on the Perth property market for 2019 in their Housing Boom and Bust report. Despite a small decline in 2018, Perth is expected by SQM Research to remain relatively stable or grow modestly. They give a range of -1% to +3% growth for the Perth market. Hobart is currently seeing significant growth (10%) in house prices and, although expected to continue, it will slow to 2% to 5% in 2019 and 2% the following year. Records show current migrants include young people and families. Unit prices are predicted to follow a similar trend, with current growth at 9%. This is set to slow to 2% to 4% in 2019. Hobart has experienced meteoric growth in 2018, and according to SQM Research’s newest Housing Boom and Bust report, this trend will remain strong into 2019. In their base scenario predictions, they predict a +5% to +9% growth in property value in 2019. As with Perth, Darwin has experienced a significant decrease (19%) in median house price since 2014. Experts predict prices to bottom out this year and remain stable in 2019 before increasing by 2% in 2020. The slow pace of expected growth is attributed to an oversupply of housing in the market. Darwin has seen the highest decline in median unit price this year, with a decrease of 21%. As with houses in Darwin, unit prices should remain stable during 2019 before increasing by 3% the following year. Darwin is predicted by SQM Research’s Housing Boom and Bust report to see further declines. 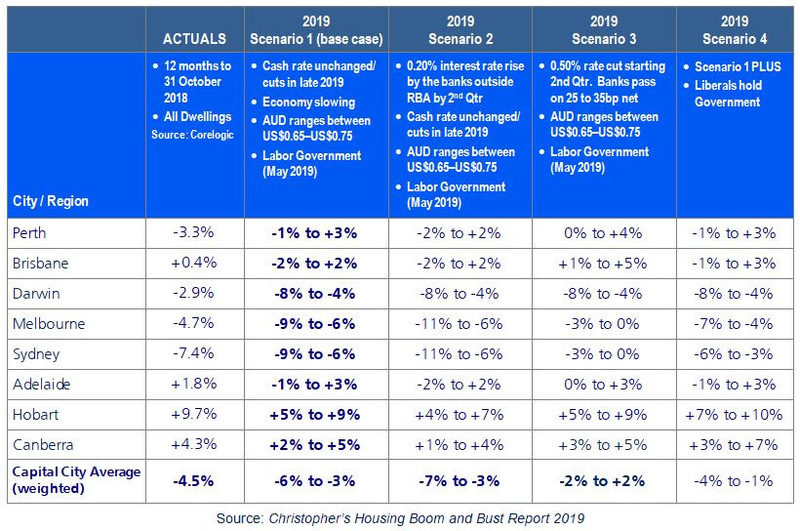 In all of their prediction scenarios (which account for varying amounts of bank intervention and political shifts), Darwin is expected to fall somewhere between -4% to -8% in property value over 2019. As 2018 closed, SQM Research updated its forecasts to include 2020 to 2022 with assumptions based on the Labor government winning a May 2019 election. They have looked at the potential effects of cash rate cuts, changes to rental yield, capital gains tax increases and negative gearing reforms. Prices are set to fall between 4% to 12% in the coming years if cash rates are cut and Labor’s capital gains tax/negative gearing changes are passed. In these scenarios, Sydney and Melbourne are set to be hit the hardest with potential for double-digit losses, while smaller markets are set to lose or gain a small margin. A third scenario posits another strong period of property price growth if reforms are not put in place by the new government. If you are in the market for a new home or to sell your current home it’s vital to be aware of current predictions and expected changes, especially in your local area. Your local real estate agent has in-depth knowledge of the property market and can help you stay informed. Find a quality real estate agent in your local area now using our agent comparison tool and get expert advice on your current property investment portfolio or potential strategy.